Well, hello there! My goodness, it's been a while since my last post! Time seriously flies by. I went into this blogging thing thinking I'd post at least a couple times a week, preferably more, but, man it has been difficult to find the time lately. I have lots of pictures to post, it's just getting around to doing it. Sometimes I'm quite the procrastinator. Over the next month or two, posts will likely be limited as I'm finishing up my dissertation so I can (finally) graduate this Spring. Basically for the next several weeks, I will have no life and will live in a cave, but I will emerge with unyielding glory and triumph (or something like that). For this mani, I used Zoya Zuza on my index, middle, and pinkie fingers. 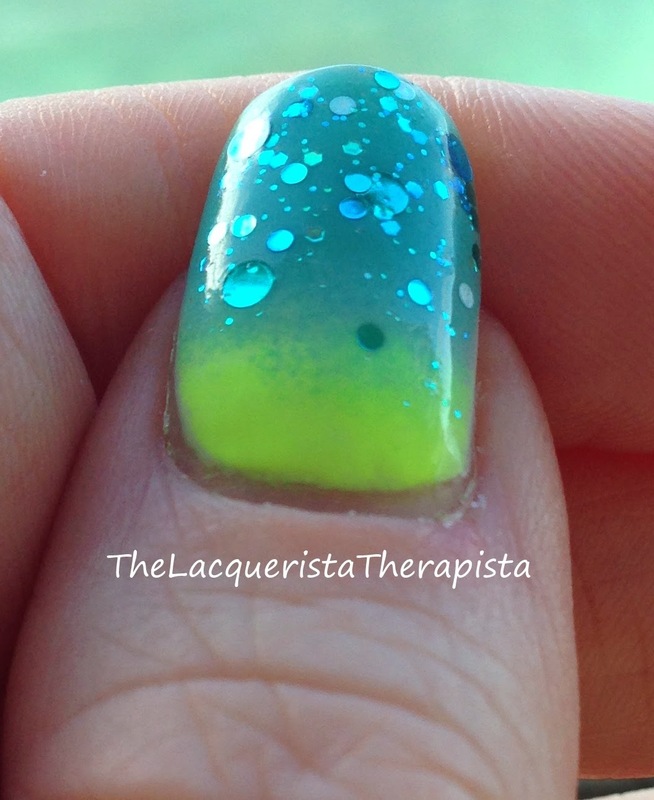 The thumb and ring fingers were done using a damp sponge to create the gradient. I did a base layer of Essie Marshmallow (to make it squishy looking and to help the neon pop). Then I put a line of China Glaze Yellow Polka Dot Bikini, a thin line of Essie Marshmallow, and a line of China Glaze For Audrey on a damp makeup sponge and dabbed it on the nail. 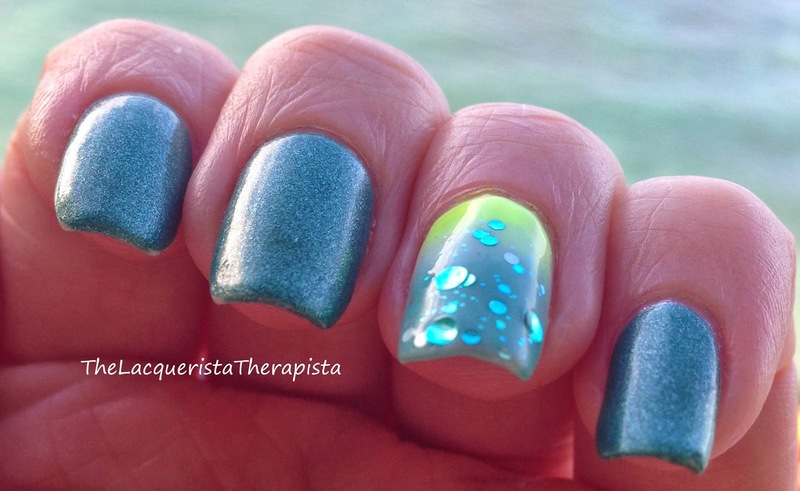 The glitter topper is Elevation Polish - Stay Behind, Catch A Wave--one of my absolute favorite polishes. Unfortunately, in the thumb close-up, Essie Marshmallow doesn't really show up. I dabbed it a bit too much, but you can see it on the ring finger. I love the sparkling ocean effect the glitter gives. The turquoise color looks just like the water in Hawaii and the white from the Essie polish is meant to look like the foam from the ocean. And the neon? Well, it's fun and sunny...like the beach! 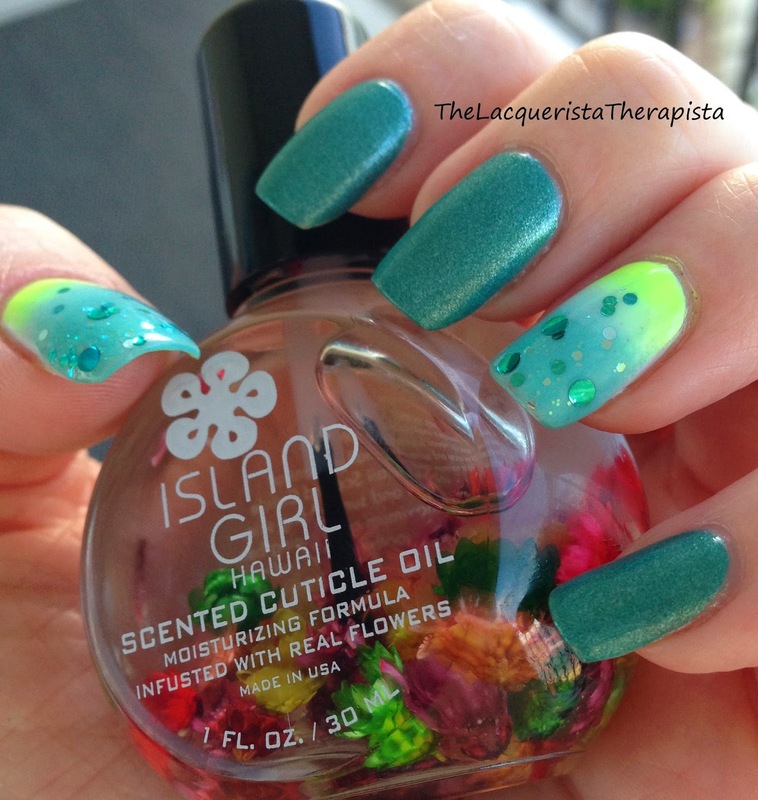 All polishes used in the mani are from my own collection and were not provided for review.